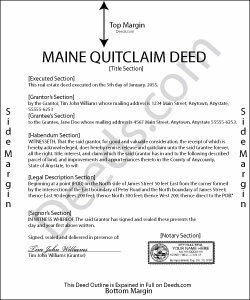 Quitclaim deed documents in the state of Maine are governed by 33 M.R.S. 161, which states that "a deed of quitclaim of the usual form conveys the estate which the grantor has and can convey by a deed of any other form." 33 M.R.S. 162 provides that any deed conveying rights to land must be in writing and signed by the grantor or an authorized representative. 33 M.R.S. 201-A adds the additional obligations of a reference to the prior book, page, and/or document number of the deed wherein the grantor gained interest in the property; a complete legal description in metes and bounds or a specific reference to a previously recorded survey plan of the land; and a clear statement of any exceptions, reservations or negations of warranty. 33 M.R.S. 306, 456, and 775 combine to present the statutory form for a quitclaim deed without covenant, and to expand the instructions to include the name, address, municipality, county, state, and marital status of all grantors and grantees; the correct title for the document (Quitclaim Deed without Covenant); the appropriate language of conveyance; a release of rights recitation from the grantor's spouse, (if any); the execution date (when the quitclaim deed is signed); and the notary's acknowledgement of all signatures. 33 M.R.S. 651-A states that the signor's typed or printed name must appear beneath all signatures. Maine follows a "notice" recording statute, as codified in 33 M.R.S. 201, which relates that all recorded real estate documents take precedence over unrecorded instruments. The statute also contains the obligation to present the quitclaim deed for recordation in the county where the property is located. In general, recording the deed as soon as possible after executing it is an easy way to preserve the rights and interests of all parties to the transaction. In addition, entering the deed into the public record preserves the chain of title (ownership history) for the property and should simplify future sales of the land. Barbara B. said: Great forms and instructions! Reply from Staff: Thank you Barbara. Neil S. said: Very impressive. The only change I would suggest is a smaller font on the title. Gisela A. said: Great selection of documents. Properly formatted form also included great instructions and the example was very helpful. Filed it myself - no problem! Beverly M. said: GREAT FORMS. THANK YOU.